Darren Callahan, director and playwright, filed this report from the front lines of the 2010 Dionysos Cup festival, coming this May 13th through May 23rd from Polarity Ensemble Theatre. Death! Devils! No, this is not a posting about one of the horror plays that I’ve sorta-kinda gotten known for in the Chicago theatre scene (such as Horror Academy or The White Airplane.) In fact, this isn’t one of my plays at all – I’m just the lowly director. But, don’t worry, as P.T. Anderson once famously declared: There Will Be Blood. Death & Devils is G. Riley Mills’ exceptional true-life drama about early 20th century charlatan John R. Brinkley. Settling in Kansas with his wife Minnie and his faithful shill Dwight Osborne, Brinkley made millions during the Great Depression. He sold snake oil, built a hospital, published, traveled, ran for Governor, and, not to be overlooked, became known for a suspect medical procedure that cured nearly every ill, a procedure that was particularly known as a cure for male impotence. It’s an absolutely terrific fall-from-grace story in the big tradition of Citizen Kane or All The King’s Men. As the Dionysos Cup has many dozens of scripts submitted, I was lucky enough to read Death & Devils early in the process and nominate it up. I was absolutely thrilled to snag it when it made the final four. Old fashioned, muscular drama was always something I favored, and I couldn’t ask for a more dynamic and professional script to helped develop. And the cast. Oh, I got lucky here, too. 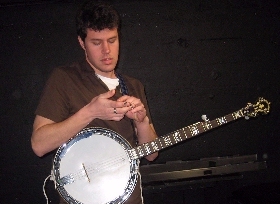 Kevin Stark plays the charismatic Brinkley. I saw him in How To Disappear Completely and Never Be Found and was blown away. He was one of those actors you can’t stop watching, and you miss when he’s not onstage. I had hoped for a chance to work with him and I’m just glad it came about so soon. Ryan Ben as Dwight Osborne is the perfect mix of everyman appeal and dark humor. He was in my slasher film, Spikes, and is very adept at scaring the crapola out of people, should it come to that. Charley Jordan, longtime Polarity Ensemble Member and Polonius in their acclaimed revival of Hamlet, rocks as pig farmer Bill Stittsworth, Brinkley’s first patient. I basically needed someone who looks like he could intimidate Kevin Stark, and I think I found ‘em. Zach Uttich is new to Chicago and hasn’t stopped working. That dude is cast in everything. That should tell you something. He plays a multitude of roles here. Lauren Fisher was in acclaimed The Hopper Project for WNEP. And Alex Meyerchin plays one hell of a singing cowboy. What is it like to act in a stage production that centers around a tough topic, yet present that topic with enough shades that an audience will respond, not just to the central theme, but to each character’s point-of-view? For Polarity Ensemble Theatre’s World Premiere production of Lisa Rosenthal’s original work The Good Harvest, the cast doesn’t aim for a bulls-eye – it’s more of an explosion that scatters in unexpected directions. In a pre-show chat with actors Mary Nigohosian (“Joan”) and John Walski (“Davis”) both were candid how the material has played with audiences in the show’s early performances. “There’s so much drama in the script,” says Ms. Nigohosian, “if the crowd is quiet, you know they’re engaged. There’s not a lot of shuffling in seats. They’re trying to figure out these people.” In a play that, in summary, sounds like a very simple story (woman tries to carry a successful pregnancy after her ideal adoption candidate is killed), there is an immensely complex set of relationships between Joan, Davis, and their triplets. 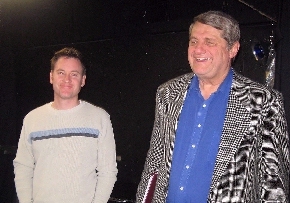 Performances of The Good Harvest take place at the Polarity Ensemble Theatre in Wicker Park at the Josephinum Academy, 1500 N Bell, Chicago, through May 2, 2010. Showtimes are Fridays and Saturdays at 8pm, and Sundays at 3pm. Regular performances: $19. $15 seniors over 65. $10 students with ID. All tickets are general admission. Tickets may be purchased by calling 1-800-838-3006 or visiting BrownPaperTickets.com. What Makes an Audience Exciting? What made him interested in this particular play? From Mr. Engling’s perspective, the playwright can sometimes come before the play. “I love the connection Lisa has with us as much as I love the play.” Impressed by Chicago playwright Ms. Rosenthal as a person, as a force, and as a writer, he became committed to developing a partnership that would result in a world premiere. 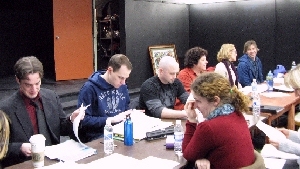 In 2006, Polarity began its Dionysos Cup Festival of New Plays, a series of staged readings where four plays from Chicago playwrights receive development and two performances each—one of the events in which the audience has a profound and direct influence on the work of the ensemble. Ms. Rosenthal’s Retreat was one of the hits of the festival. This started talk from Polarity about a possible collaboration. Polarity continued to produce works, such as new takes on Hamlet, Othello in mask, and A Streetcar Named Desire, and also original works, such as the surreal mystery The White Airplane and the genuinely creepy Ghost Watch. A story of artificial insemination, multiples, and the lost child of Joan, a dead woman who appears in flashbacks, The Good Harvest uniquely refines the family drama to the sharpest point. Posted in From the Ensemble | Comments Off on What Makes an Audience Exciting? “The best lighting in the world is the kind you never hear about in reviews,” laughs Stephanette Smith, “but it takes a lot of time and collaboration to make that sort of hypnosis happen.” Smith is the lighting designer for The Good Harvest. 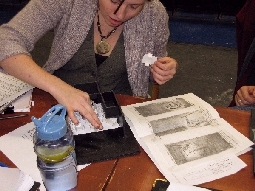 Smith, in partnership with Ashley Ann Woods, scenic designer, collaborate again after their phenomenal work on Polarity’s Fall 2009 production, an acclaimed revival of A Streetcar Named Desire. “If the lighting and the set don’t work together,” says Woods, “a whole layer of the performance will be at risk.” Beginning the process with a groundplan, sketches, and a white model, the two have devised a set of great depth for multiple changeovers—moving between harsh reality of the present, to the murky remembrances of character’s pasts, to even dreams. To achieve this effect, the set is being built as a series of scrim-like walls whose translucent quality allows light to reveal new worlds behind them. When starting the process, both took a look at what kind of a world this fictional family inhabits – what kind of house, what kind of environment did Joan and her triplets grow up in? Concrete concepts are done first, then secondary ones with more abstract approaches. This allowed for the manipulations of the perception of things and is “a journey and a definition of what’s possible,” remarks Woods. What’s possible was often restricted by the space that currently serves as home for Polarity Ensemble Theatre. The Good Harvest is their fourth full production in the Josephinum Academy, a comfortable storefront space with much to offer, but not without limitations. Woods and Smith proved to be a potent combination on Streetcar—the set prompted “wows” from the audience. The lighting, too, heightened the emotions of Tennessee Willliams’ sexually charged Southern melodrama. I finally got to see Tim Burton’s Alice in Wonderland. (Directing a show like The Good Harvest means your free time is at a premium until it opens). By the time I saw it, all the critics had had their crack at it. One of the major complaints was that this classic story had been put in service of a conventional feminist be-all-that-you-can-be theme. The movie begins and ends with scenes in the “real” world. Alice is a young woman who is expected to accept the marriage proposal of an unattractive young Lord. Before her return to Wonderland, she is ill-equipped to face her challenges. Afterwards, she can. To focus on the wrapper, however, is to miss what’s been added to the delicious inside. 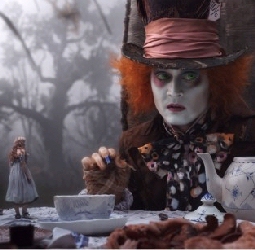 Much is made of Alice’s identity when she arrives in Wonderland (called Underland in this sequel). She is mistaken at first for the “wrong” Alice, but as the story progresses, we find that she is not the wrong Alice, but an Alice who has lost a great deal of herself. She cannot remember her earlier visit when she was a child, when she mistakenly called the world Wonderland. She has been daunted by the death of her father, a man of epic imagination, as well as a loving father. She has been overwhelmed by her place in the world and the expectation that she marry the young Lordling, who clearly has no appreciation of Alice. The Mad Hatter tells her: “You used to be much muchier before. Yes, you were much more Alice the last time we met. You have lost your muchness.” Parts of her bravery has died. The story of this Alice sequel is the story of Alice regaining her muchness. Here the filmmakers touch on a truly universal theme. Who among us has not been diminished by life? From the minor assaults of criticisms, insults, difficult co-workers or bosses, to major family troubles, rejections, loved ones’ deaths, career failures and failed marriages, we get worn down. Parts of us die, and we become diminished. In the Underworld, Alice wakes up to this diminishment of herself for the first time in her young life and musters the will to restore herself. She takes it as a challenge to overcome. “Lost my muchness, have I?” she says in a wonderful scene in which she uses the severed heads in the Red Queen’s moat as stepping stones to attempt to save The Mad Hatter. The heads are a perfect representation of the personal deaths she must overcome in order to become fully alive once again. From that moment on, the adventure tale is laden with the story of the girl restoring herself. Part of that is finding the ability to slay the Jabberwocky. Convinced that she is incapable of slaying anything, Alice only finds the strength to face her fate when she has a final encounter with the caterpillar. What allows her to see past her fear is the caterpillar’s acceptance of the end of one life leading into a transformation to the next. He must allow his caterpillar self to die for the butterfly to live. Alice has been busy reviving dead parts of herself, but the last transformation is to let go the part of herself that cannot possibly slay the Jabberwocky. Her passive self must die—and symbolically (and actually) she must kill the Jabberwocky to progress. Only when she cuts off the Jabberwocky’s head and drinks its blood can she return to her own world transformed and ready for the challenges she faces. As the critics have said, the challenges she returns to do seem like familiar stuff in contemporary juvenile fiction, but that’s okay. Her journey through Underland touches on a universal story of soul transformation—and that makes it a worthy reimagining of a classic tale. 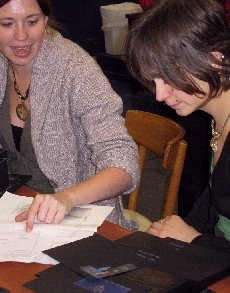 You are currently browsing the Polarity Ensemble Theatre Blog blog archives for April, 2010.